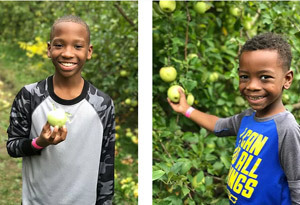 If you’re looking to experience a new apple orchard and pumpkin patch that’s not that far from home, then consider County Line Apple Orchard in Hobart, Indiana. Last year, my cousins who live in the Chicago area asked us if we’d like to visit and of course I said yes. We had such a great time, that we made plans to go back again this year. But, we stepped it up a notch. 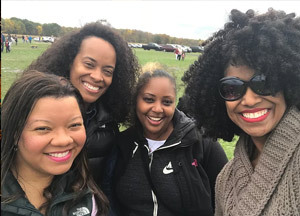 My family, Ashieka, Khesi, Kiarra and Tiffany decided to give our kids a little more time together by staying in a nearby hotel the night before our adventure at the apple orchard. We all met last Saturday afternoon at the hotel. The kids had a chance to get reacquainted by playing games that we brought. Then, we headed straight for the pool. The kids hung out there for a while and then we ordered pizza. After dinner the kids played more games and devoured snacks, cookies and popcorn while watching movies. 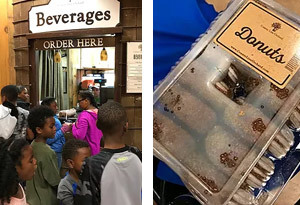 At some point, we all went to sleep and were back at it in the morning at about 8 a.m. when everyone headed down to the first floor to enjoy a buffet breakfast. After we ate and finished getting dressed, we all piled in our cars for the short drive to County Line Apple Orchard. Last year, we came a little earlier in the season and it took my family an hour just to drive about 3 miles to the parking lot of the orchard. However, this year, there was no wait. We drove right into the parking lot with guides telling us where to park. As soon as we arrived we snapped this photo of the kids near a ton of pumpkins lined up outside of the main building. Next stop, buying tickets to ride the tractor to the apple orchard plus the corn mazes. 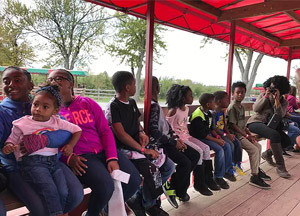 Once you’re on the tractor ride, you have the option to get off early to pick a pumpkin from the pumpkin patch, so that’s exactly what we did. And, if you don’t know this about my family, in due time you’ll find out that we love impromptu photo shoots. We made sure to take plenty of photos with the kids. Then, we got back on the tractor and rode it to the corn maze stop. By this time, my youngest child was definitely over the mini vacation and due for a nap. So, you’ll see he wasn’t really into taking photos. But, the bigger kids had a blast in the corn maze. 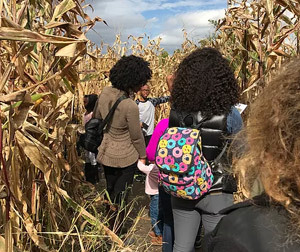 They did a lot better than we did last year, but after about 45 minutes and 4 or 5 found stops, we decided to call it quits and when we saw a way out, which was through the mini corn maze for little ones, we bolted. Please take my advice… wear comfy shoes because you’ll be doing a lot of walking, which I enjoy. And, you won’t feel so guilty when you make it back to where you started and enjoy a warm and delicious apple donut and warm apple cider. Our third stop was the apple orchard. There are so many different apples to choose from. Everyone grabbed several of their favorite apples off the tree and then we started our journey to where we began. Inside this huge barn looking building you’ll find a ton of things to choose from. I absolutely love the apple donuts (we buy a dozen), which are warm when you get them and a cup of warm apple cider (we buy a half a gallon). We also grabbed a bag of fresh kettle corn and my kids happened to see kettle corn flavoring for our own popcorn at home, which they had to have. Then we headed to the register. My total was less than $20 and that included the apples we picked. So, while you could definitely spend more, you don’t have to plan to spend a lot. If you’re looking for a fun new place to take your little ones next fall. I truly recommend County Line Apple Orchard. You won’t be disappointed! 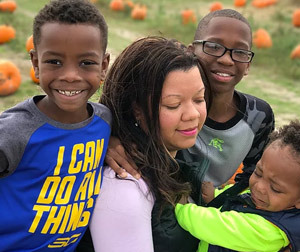 Mike, Hyacinth, Jayden, Chase & Kaleb live in Fishers, Indiana and run the site Soul of a Black Family! They work hard and love to spend time together when ever they can. The summer time is a fun time in the Rucker household. They're always on the go and looking for something fun to do with the kids on a budget. Check out their site to see what's fun to do in and near the city of Indianapolis.